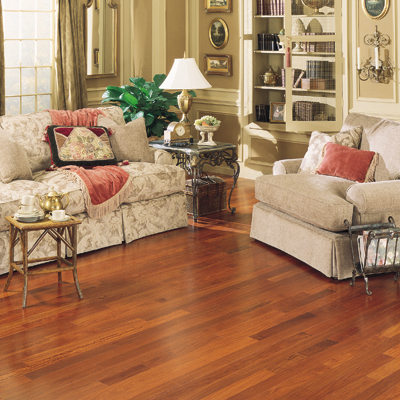 There are thousands of choices in hardwood floors. Where do you start learning about what is right for you? That would be, mmmm, right here! Every job is unique, and there are always exceptions to the rules. So consider this general information. How does the industry generally subdivide types of hardwoods? Solid hardwood - Usually 3/4" thick solid. Engineered Hardwood - Various thicknesses from 5/32" to 9/16". A very few might be as much as 3/4" thick, but those are unusual. The second way we mentally tend to break down the catagories is "Prefinished" versus "Sand & Stain" (on site). When should you consider 3/4" solid? If you are installing on a wood subfloor and are on or above grade, 3/4" solid is appropriate. When do you look at engineered? If you have a concrete subfloor, are installing below grade (i.e., basements), or want to go with a wide plank, engineered tends to be the answer. But engineered can also go any place that solid hardwood can be installed. One exception to the above is specially-milled solid wide plank hardwood we carry. More about that later. Exactly what is engineered hardwood? Engineered has layers, like plywood. The layers are usually criss-crossed at 90-degree angles to each other. The top layer is the "wear layer," and is actual hardwood. The thickness of that wear layer and quality of the wood tend to directly correlate to the cost of the product. Because it releases moisture better than a piece of solid wood, it tends to be more stable, i.e., doesn't expand or contract as much. And you can glue it down to concrete. If you glue down solid hardwood the floor will usually fail because of being unable to move, causing it to heave and buckle. Can engineered hardwood be re-finished? Generally yes, but it needs someone with a light touch and can usually be re-finished only one to three times. However, it can be "screened" any number of times. Screening means we scuff the finish and apply a new finish without actually getting into the wood. This is appropriate for superficial scratches to the finish, not deep gouges. How often can solid hardwood be re-finished? Until the nail heads show up. Just because a piece is 3/4" of an inch thick doesn't mean you can sand down the entire thing. The nails are inserted through the tongue and when the wood above them is sanded away, the floor is finished. That usually means about 5-7 sandings, depending on how light a hand by the person doing the sandings and how deep gouges are. How long should a hardwood floor last? If well taken care of, literally the life of the house. We've been in houses in Central Kentucky with a floor that looks beautiful that has been down over 100 years. One house had a BEAUTIFUL original heart pine foyer from 1792! Isn't all hardwood pretty much alike? Shouldn't I just pick on price and a color I like? Hardwood is about as much alike as horses are. You can have a Kentucky Derby winner, or you can have a plow horse. Or a great hunter-jumper or a Shetland pony. It really depends on what you want, but don't make the mistake of thinking all woods are alike. Speaking generally, 3/4 x 2-1/4 white or red oak "strips" #1 common is pretty much the baseline for pricing. Oak is hard and durable and has a strong grain, will take stain well. Wider widths tend to increase price. "Select" grades will cost more. Lower grades, like #2 or #3, will cost less. Don't confuse grade as automatically being the same as "seconds" or "thirds," which often have designations like "cabin grade, tavern grade, utility grade," etc. What's the difference in prefinished versus sand & stain? The wood is exactly the same. Prefinished has the stain and polyutherane applied under factory-controlled conditions, usually 6 or 7 coats, and usually with a hardening agent, aluminum oxide, added. Most, but not all, prefinished woods have a slightly beveled edge. With prefinished, you are walking on it as soon as it is nailed down. With S&S there is dust from sanding, though vacuums catch most of it. There WILL be clean up. Then you must stay off it while each coat of poly dries, which will vary with environmental conditions such as warm dry days versus cold and rainy. And the poly smells, so if anyone is bothered by the smell, opt for prefinished. Unless you are just lucky, and some people are, trying to match existing wood is usually a job for S&S. We can often get a 95% match that way, but there are some caveats attached to that! You go to our special line of wide plank floors, which are specially milled and cured from specially selected species raised in managed forests. Some of these can go as much as 20" wide, with 3" to 11" most common. This is a whole topic in itself, but you probably need to see us in the store to talk about that in detail. When I see a price per square foot advertised, should I just figure my square area times that price? No. Usually you just see a price per square foot for the wood itself. That does not include things like sales taxes, freight, underlayment, or removing and replacing quarter round. And most places figure cheap pine unfinished quarter round. And don't forget transitions to other flooring surfaces. Hardwood transitions for prefinished wood are usually about enough for two standard doorways and start at around $45 for material only. Some species can double the price of transitions. You also need to figure a waste factor. You can't do"X" square feet with exactly that amount, you are going to have cuts and waste. And, if you have floor or baseboard vents, doing wood vents to match looks wonderful. Vents will start at about $45 custom matched to the floor, and go up. A typical flush-mount oak return air vent will run about $300 to $400. The cost of the wood is only ONE factor of maybe 20 to over 100 line items that go into a complete job quote if installation is involved, depending on the extent and complexity of the job. That doesn't mean the pricing will make your head explode, but you should recognize that a lot more goes into a well-installed floor than just the wood. What typically needs done for a successful installation? Old floor coverings usually need to come up, with some exceptions. We need to look at transitions to other surfaces. Furniture and appliances need to be removed and re-set. Subfloors, both wood and concrete, need proper preparation. Moisture test(s) often need to be done. Type of underlayment needs to be considered. If baseboards are being replaced they need to be removed, new ones selected, and painted or stained. Quarter round or shoemold must be removed and replaced, which also means painting or staining. If the job is S&S the lving space needs to accomodate people living there during the job or else done while the family is out of the premises, maybe during vacation. Store hours are 10-5 M-F, 10-3 Sat. Or e-mail us at grahaminteriors@yahooo.com, or call at (859) 277-8383.